I should preface this by saying I really did try an learn some Turkish before visiting Istanbul and the western coast. I had some language podcasts and a phrase book. There were times when that was great, times when the basics and hand gestures were enough and a couple times when conversation wasn’t even needed but I still felt like I was following story. This is one example of the latter. We took a day trip ferry ride up the Bosporus to the last village of Anadolu Kavağı. 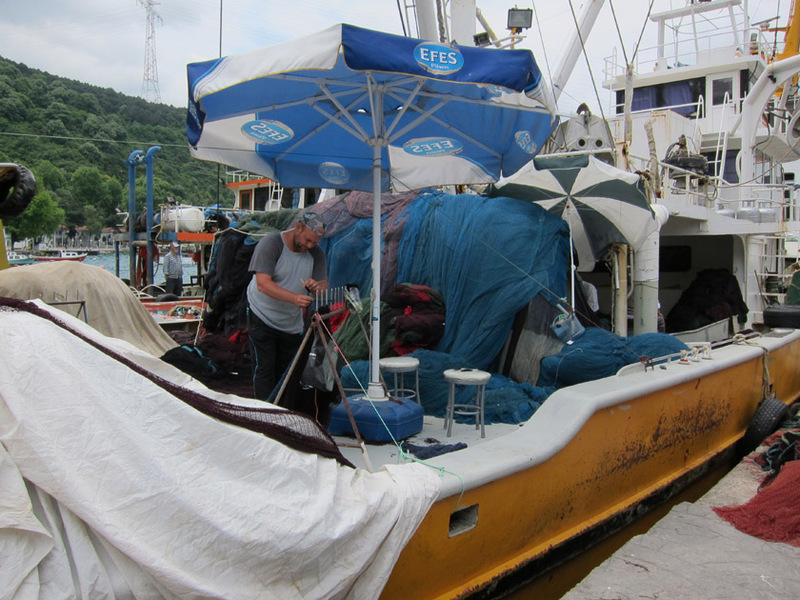 We had a few hours to explore before the boat would return. After a quick lunch, we climbed the hill to the medieval fortress for some amazing views. 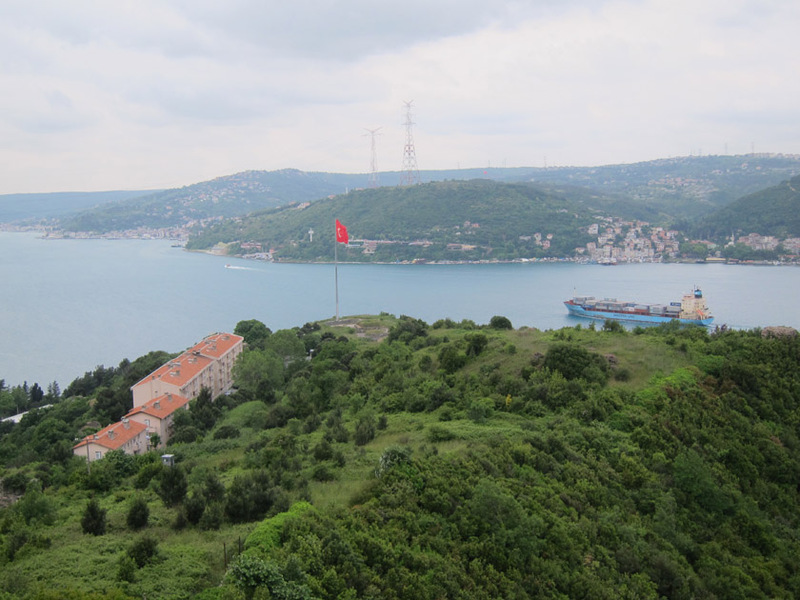 It was well worth the climb to see the Black Sea but didn’t take as long to reach as we though and so we wandered back to the waterfront to look around before our ferry left. 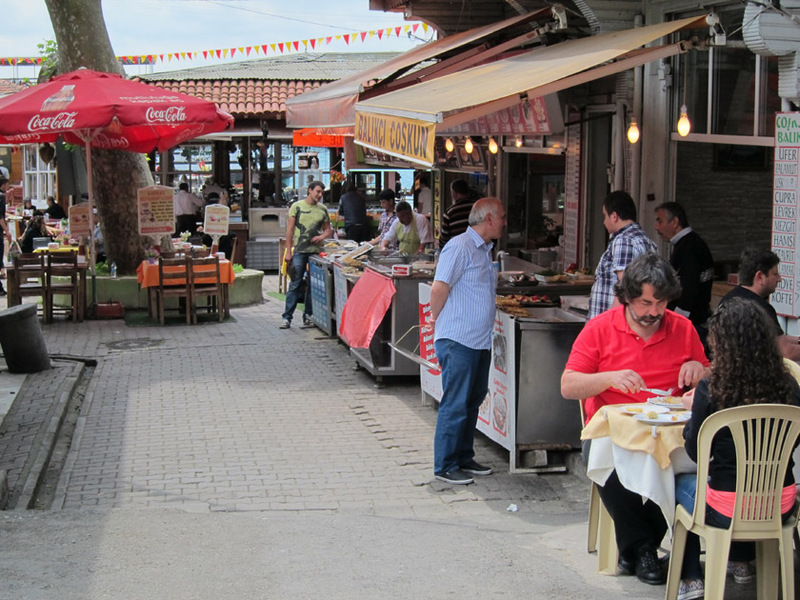 Expecting literally a boat load of tourist each day, the docks of Anadolu Kavağı are lined with fish restaurants and their aggressive touts looking for your business. By now lunch was over and the men were just standing around talking. They were staring intently at the cobblestone gutter alongside a building leading into the ferry terminal square. They pointed and waved me over to look too. A cat had caught a mouse and was playfully moving it through the gutter! We all laughed as it batted the mouse and threw it up in the air. Maybe we startled it, but the orange cat picked up his prey and scurried over to a circular bench in the center of the square. The cat continued to play but the mouse woke up. It started running along the base of the bench trying to escape. I held my breath and quietly giggled along with the men who had been watching. We could see the mouse, with cat in close pursuit, heading underneath some unsuspecting tourists seated there. The mouse and cat eventually ran under the legs of three older ladies who were sitting on the bench. One woman screeched and flew off the bench! Her friends quickly followed. We exploded in laughter! Miming what had happened, we continued to chuckle. 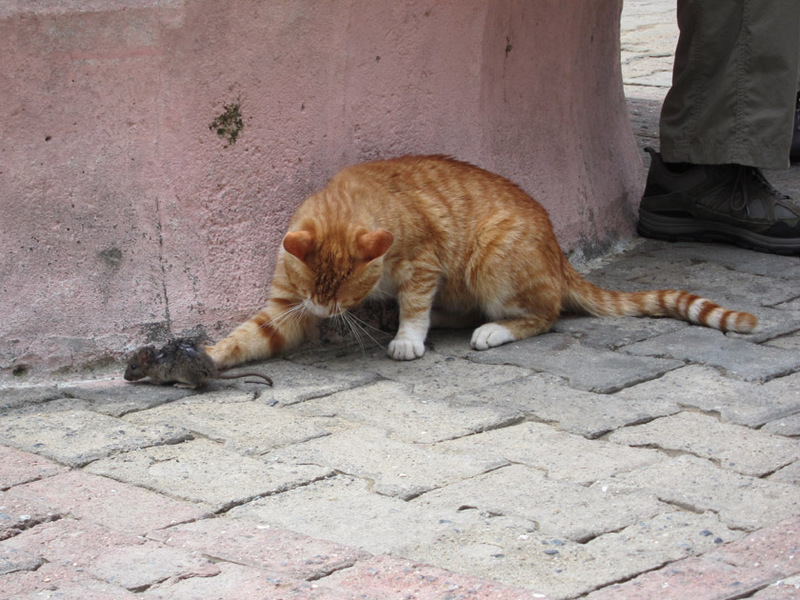 The cat picked up the mouse and ran off into the dining area of the nearest outdoor restaurant. One man in our group hollered and ran after the cat in his restaurant. We all started laughing again as he tried to chase it out. After a few more smiles, our little crowd dispersed and I headed back to Istanbul having observed the hilarious wildlife in Anadolu Kavagi with the locals.